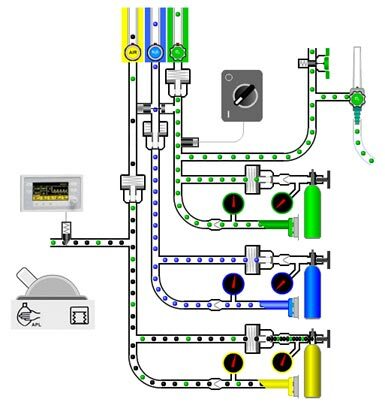 In this transparent reality simulation, the ventilator drive gas may be configured to come from either the oxygen or air manifold; an Aestiva or Modulus II high pressure system is user-selectable and allows users to appreciate the subtle differences between the 2 designs such as different oxygen failsafe valves and cylinder pressure gauge behaviors when the cylinders are removed. Cylinders may be disconnected and drained to see how the systems respond to inadequate pressures. The operation of the ball-in-tube auxiliary O2 flow meter is simulated.